Your list of things to see and do now includes Apartheid Museum, Top of Africa, Constitution Hill, and other attractions. Start off your visit on the 12th (Fri): get a sense of history and politics at Constitution Hill, take in panoramic vistas at Top of Africa, then examine the collection at Apartheid Museum, and finally don't miss a visit to Nelson Mandela Square. Get ready for a full day of sightseeing on the next day: try your luck at Gold Reef City. For more things to do, where to stay, traveler tips, and other tourist information, refer to the Johannesburg trip maker tool . Sao Paulo, Brazil to Johannesburg is an approximately 14.5-hour flight. Due to the time zone difference, you'll lose 5 hours traveling from Sao Paulo to Johannesburg. Plan for little chillier nights when traveling from Sao Paulo in April since evenings lows in Johannesburg dip to 14°C. Wrap up your sightseeing on the 14th (Sun) early enough to travel to Cradle of Humankind World Heritage Site. Your day-by-day itinerary now includes Maropeng Visitor Centre as well as Sterkfontein Cave. To see traveler tips, ratings, other places to visit, and other tourist information, go to the Cradle of Humankind World Heritage Site trip planning website . You can drive from Johannesburg to Cradle of Humankind World Heritage Site in 1.5 hours. Expect a daytime high around 28°C in April, and nighttime lows around 13°C. Wrap up your sightseeing by early afternoon on the 14th (Sun) to allow time for travel to Sun City. Sun City is a luxury resort and casino, situated in the North West Province of South Africa. You've now added The Maze of the Lost City to your itinerary. Kick off your visit on the 14th (Sun): get your game on at The Maze of the Lost City. For ratings, maps, photos, and other tourist information, refer to the Sun City travel route planning site . Drive from Cradle of Humankind World Heritage Site to Sun City in 2.5 hours. April in Sun City sees daily highs of 30°C and lows of 15°C at night. On the 15th (Mon), you'll have the morning to explore before heading off to Broederstroom. Located in the foothills of the Magaliesberg mountain range, the village of Broederstroom offers visitors a variety of fun activities and day-trip opportunities. You've now added Ama Zwing Zwing Zipline Tour to your itinerary. To find traveler tips, reviews, where to stay, and other tourist information, read Broederstroom trip itinerary maker website . Traveling by car from Sun City to Broederstroom takes 2 hours. In April, daytime highs in Broederstroom are 28°C, while nighttime lows are 13°C. Wrap up your sightseeing by early afternoon on the 15th (Mon) to allow enough time to drive to Pretoria. A hub of research and education, Pretoria remains a quiet city filled with significant historic buildings and fascinating museums. To find photos, where to stay, traveler tips, and tourist information, read Pretoria trip app . Drive from Broederstroom to Pretoria in an hour. While traveling from Broederstroom, expect little chillier days and a bit warmer nights in Pretoria, ranging from highs of 23°C to lows of 19°C. 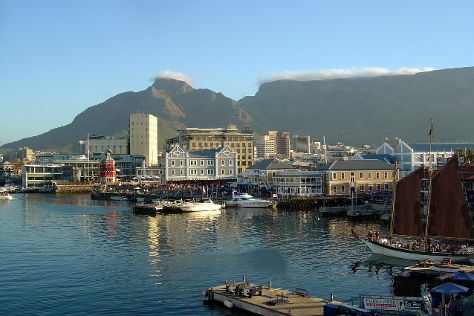 Wrap up your sightseeing on the 15th (Mon) to allow time to travel to Cape Town. Your day-by-day itinerary now includes Victoria & Alfred Waterfront, Signal Hill and Kirstenbosch National Botanical Garden. For reviews, where to stay, maps, and more tourist information, read our Cape Town trip itinerary maker site . Traveling by flight from Pretoria to Cape Town takes 5 hours. Alternatively, you can do a combination of taxi and flight; or drive. When traveling from Pretoria in April, plan for a bit warmer days and little chillier nights in Cape Town: temperatures range from 28°C by day to 14°C at night. On the 20th (Sat), wrap the sightseeing up by early afternoon so you can travel to Johannesburg. For more things to do, where to stay, and other tourist information, read our Johannesburg holiday planner. Traveling by flight from Cape Town to Johannesburg takes 4.5 hours. Alternatively, you can drive; or take a bus. You will leave for home on the 21st (Sun).